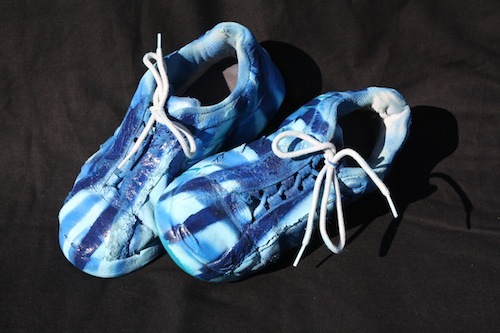 My sneakers are a reflection of my art, whether they are paint-spattered, burned or caked in dirt and mud. 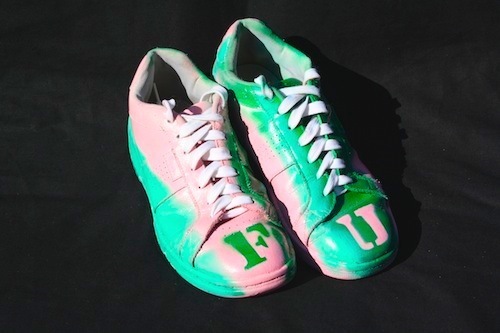 I have saved nearly all my used sneakers over the years, and recently, I started purposely painting on my shoes with the stencils and spray paints I use to make my L.A. Blue Bum paintings. 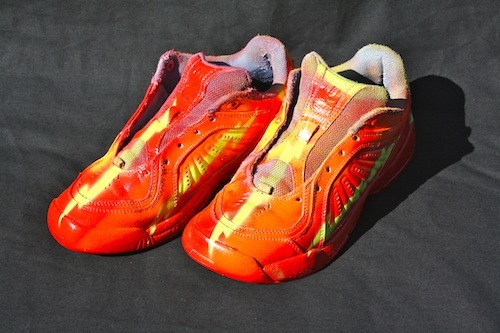 Then I took it a step further and began creating brightly colored whimsical paintings on my old pairs of sneakers, incorporating their age and relative state of disrepair. 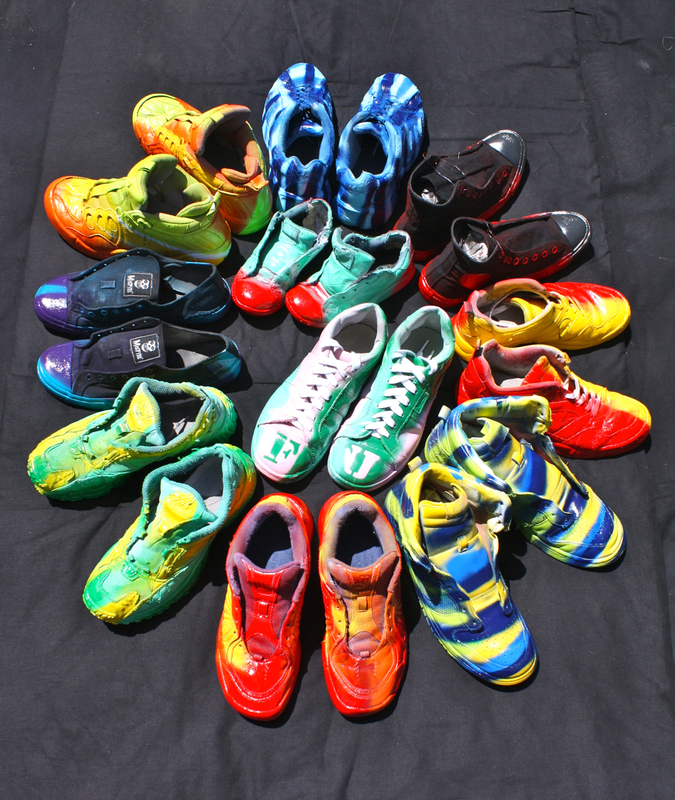 I call them my Tricked Out Kicks. 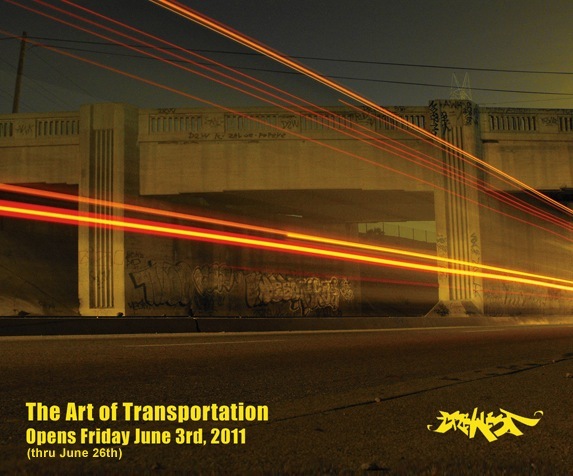 I wear them to openings and art events, and for the Art of Transportation exhibition at Crewest Gallery in downtown L.A., I was asked to exhibit some of them. 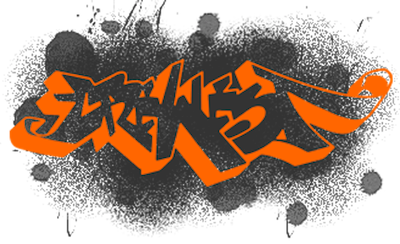 Instead of a traditional display, I decided to show them in a way that fit the theme of the graffiti-inspired show and reflected the personality of my Echo Park neighborhood: I hung them from electrical cables strung across the gallery 14 feet off the ground. 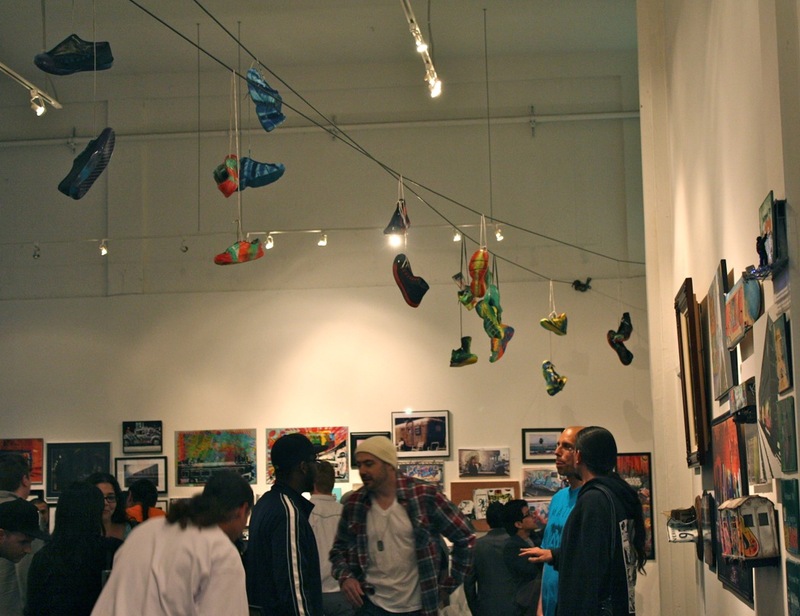 The 'Tricked Out Kicks' installation at Crewest Gallery. 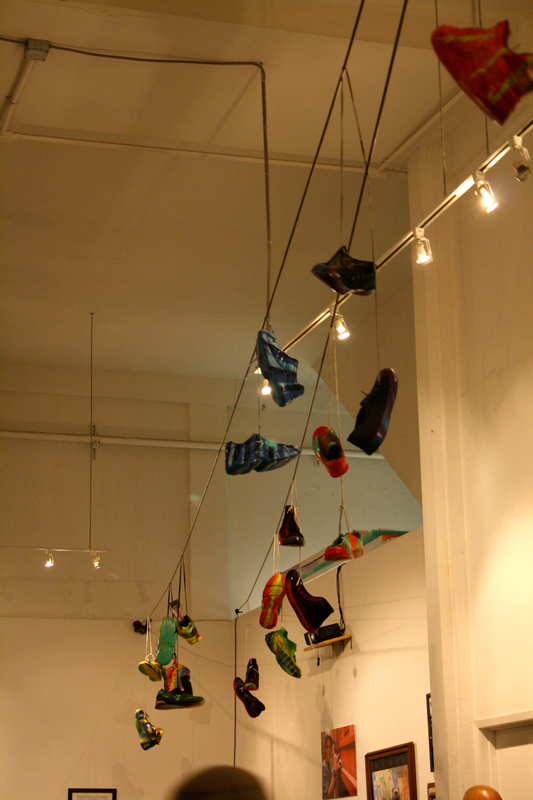 Assembled shoes in the 'Tricked Out Kicks' installation. In the spirit of the Getty Foundation-sponsored project “Pacific Standard Time: Art in L.A. 1945-1980,” the 18th Street Art Center in Santa Monica enlisted artists to create exhibitions commemorating California’s influential contemporary art movement. 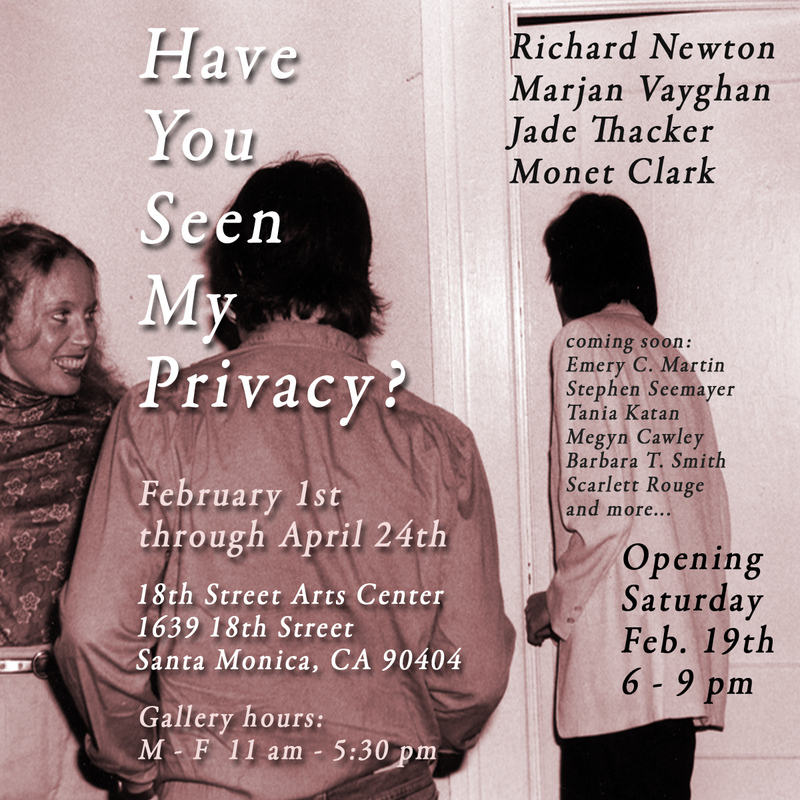 “Have You Seen My Privacy?” curated by artist Richard Newton, incorporated paintings, video, installations, ephemera and correspondence into a series of exhibits by artists whose work examines personal identity in this increasingly technological age. There were also weekly public discussions with the artists involved. Newton asked me to show examples of my work that explore issues of the loss of privacy, identity and depersonalization. 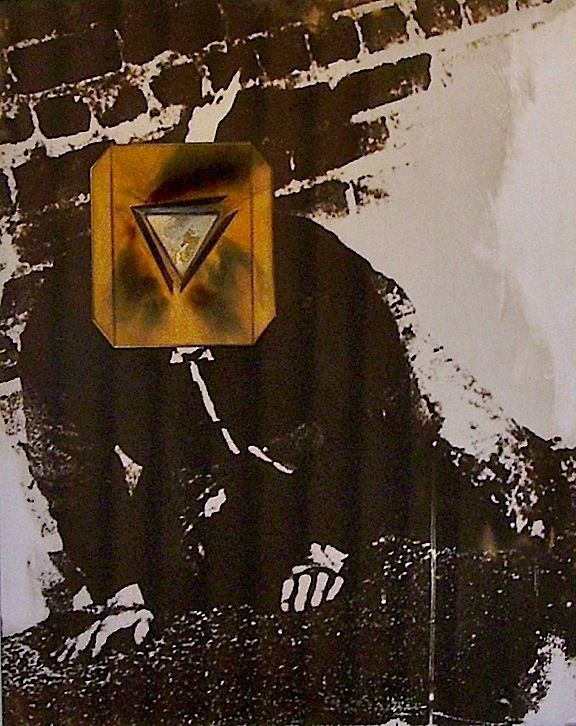 I chose life-size photo blowups of my “Burning Mask” series — a performance in which I crawled in an alley wearing a flaming triangle mask — and my “Unit in Orange” performance — in which I marched around a gallery with a number shaved onto my head and an aborted human fetus cupped in my hands. 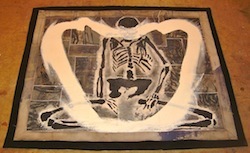 I also set out three “Body Bags” on the floor of the gallery and two “Buddha on Money Bags” meditation mats. On the evening of my public discussion, I previewed “Being Human,” an 11-minute video documentary on my nearly 40-year career. 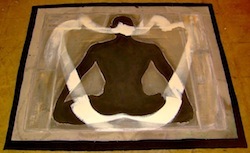 Captions: Above: (L to R) ‘Buddha On Moneybags’ c. 1995 (Under) Body Bags c.1998. (To Right) Unit In Orange c. 1978. (Below) Stephen Seemayer wearing fire mask c. 1978. (Below) Installation shot at 18th Art Gallery.